WE HADN’T been married long when my husband announced he wanted to bring a stranger home to live with us. Forever. This was no sister wife (he’s faithful as a goose). James, it turned out, was in love with the idea of a 19th-century oil portrait. He’d grown up spied on by an oil-on-canvas ancestor and felt that such an artwork gave any architecturally lackluster home an aura of peerage grandeur. Trouble was, I’d never seen an antique portrait I could tolerate for long. Every ye olden person he pointed to at auctions and junk shops looked like someone who had been diagnosed with irritable bowel syndrome before it was treatable. Who’d want to live with that? Dourness, I’ve since discovered, was part of the tradition of posing. “Actually smiling [in a portrait] could be seen as breaking with decorum,” said Sarah Moulden, curator of 19th-century collections at the National Portrait Gallery in London, who noted that by the 18th century, likenesses were common among the upper class and ascendant bourgeoisie. I spent hours scanning for The One on eBay, which currently lists 4,051 items under “antique portrait,” rejecting myriad contenders: a kindly bespectacled 1950s gran rendered in loose brush strokes; a Victorian woman in funerary garb, glaring as if I’d stepped on her petticoat; a naively painted lad with a notably large head, in red breeches and knee-length jacket; 20th-century self-portraits of handsome, angsty young men. None charmed me. 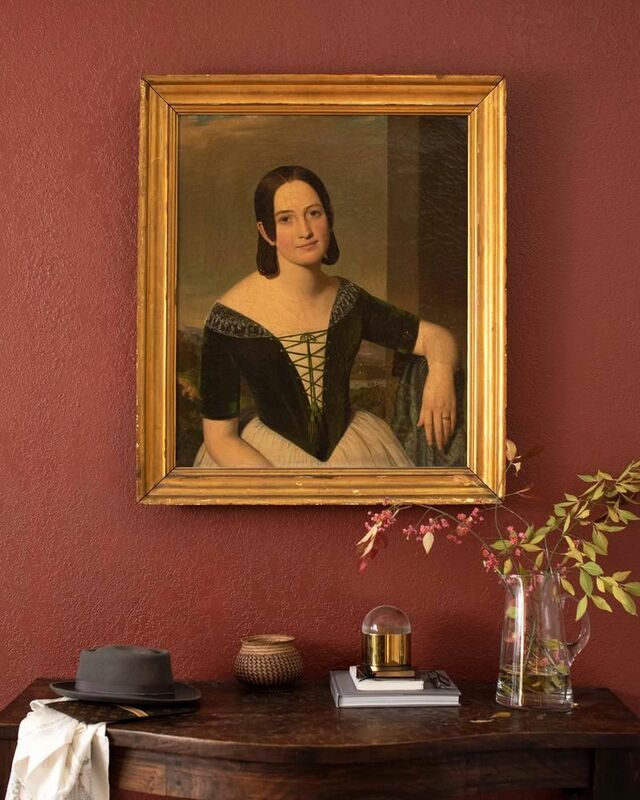 But then, on assignment in Nebraska, I saw her, smirking at me from the clogged walls of Omaha’s Antique Annex: Catharine S. Dennis, painted in 1843 and every bit the person I’d accost for conversation at a cocktail party. She was regal—her hairstyle unflinchingly center-parted, her full cartridge-pleated skirt nipped by a lace-up bodice—but she was sassy. She looked like she was about to throw her head back and guffaw. If ancestry.com could be believed, she was born in 1811 in Yorkshire, England, and preserved at around my age. She wasn’t destined to be ours, however: Catharine was priced higher than our mortgage payment, so I had to walk away. I felt like I’d ghosted my best friend. 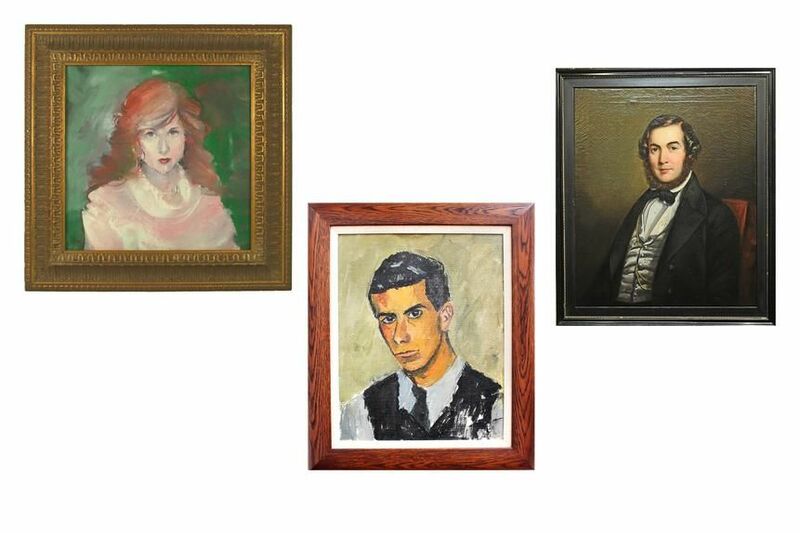 New York designer Thomas Jayne generally prefers to hang portraits in a gallery-wall array alongside, say, prints and antler mounts. Once, though, he made a large inherited portrait the linchpin of a one-bedroom apartment, hanging it alone and installing lavender and green curtains to match the subject’s dress. “Portraits have always been essential to the history of art, so if you ignore them, you’re ignoring a lot,” Mr. Jayne said, adding that they often cost less than a landscape of equal quality. And you can find options from every generation; portraiture has existed as long as humans have made art, Dr. Moulden said. Months after I saw Catharine, I was still wishing I’d spent the money and brought her home. So I convinced my husband to consider her my birthday present, called the shop that held her hostage and talked them down more than 30%. Catharine has now settled into permanent residence in our living room, where her crackled surface, moody colors and gilded frame do their part to lend a storied touch to our midcentury suburban house. Hanging above our entry table, she all but winks as guests cross the threshold, and she balances the adjacent sitting room’s hodgepodge of mass-market modern pieces with a nod to classicism. Like all worthy visitors, she’s more than a pretty face. She mocks us daily for wasting our invaluable hours bingeing Netflix, encourages me (in her tassels and lace) to step up my style and by all means to eat, drink, and be selfied—for tomorrow we may die. This self-styled decorative arts society, from the people behind Chairish, curates paintings from invite-only dealers across the globe; current portraits range from $345 to $2.75 million. London specialist Nick Cox often sells his under-$3,000 paintings on Instagram before they get to his website, with offerings dating to the 17th century. Founded in 1999, the first online auction site operated by a nonprofit sells retro options at bargain prices (bids start around $10). On estate-auction site Everything But the House, all bids start at $1. An 1830 painting of a bonnet-sporting lady by celebrated New England portraitist Ammi Phillips (creator of “Girl in Red Dress with Cat and Dog”) recently sold for $2,135. Like an unending antiques mall, with a strict no-junk-allowed policy, Rubylane currently offers a late 17th-century likeness of Count Cornelis of Nassau ($9,500) and a moody 1965 beehived brunette ($245). “Antiques Roadshow” features specialists from this Philadelphia-based auction empire—which hosts 30 live sales a year that you can bid on via its app, phone, or in person. Its Nov. 14 Americana sale will include some 60 portraits, many from the 1800s, of orators and legislative honchos from the Philadelphia Bar Association—instant gravitas for a home office.